Tea Eggs, Croquette Burgers, Lassie and Fish Fragrant Eggplant. There are a few, some may call peculiar, activities that I tend to do whenever I travel outside the US. One, I canvas convenience stores. 7-Eleven, Family Mart, Lawson, whichever has set up shop where I am. I love to see what oddities are commonplace. Tea eggs and cognac at the check-out counters in Taiwan, bento boxes, curry flavored shrimp chips, a plethora of pre-mixed cocktails in Tokyo, and the widest spectrum of fruit juices I’ve ever seen in Koh Samui. Second, I look at a McDonald’s menu. Go ahead and scorn me. I know you’re thinking, “How can she call herself a food lover and even be in the same vicinity of a McDonald’s?” Hey, I’m not going for the all organic-haute cuisine options coming out of the microwaves and fryers. The fascination lies in seeing what the super labs of McDonald’s have tested and found appealing to local tastes. Shrimp and potato croquettes instead of meat patties. Beef teriyaki burgers. Setting up shop in a rice loving country? Toss out the bun altogether and replace it with rice patties. When I was in Tuscany last summer, I was disappointed to find much of the food overly seasoned. But after sampling the uber-tested but super salty McDonald’s burgers I concluded that it must be the way Italians like their food (let the stone throwing commence… go ahead, I can take it). Third, I visit the farmers’ markets. This is always a highlight for me. I love seeing what’s in season. How produce looks in different parts of the world. For instance, carrots in Taiwan and China are 3x the size they are here but the celery is 3x smaller. Beijing has the most amazing mushrooms, size and color wise, than anywhere else I’ve visited. But I was too terrified to venture into the meat section of the market for fear that I’d run into Lassie being portioned out to eagerly waiting chefs. If you don’t speak a lick of the language, or if most of the items are foreign to you, going to a local market alone can be overwhelming. Which brings me to my next activity. Fourth, I sign up for a cooking class, many of which include market tours as part of their offering. Instructors will bring students to the local market, introduce local ingredients and processes like tofu and noodle making, which can be found at Beijing’s wet markets. So if you’re worried about being the only foreigner in a crowded Chinese market the size of two airport hangers (me at the Xinmin market in Beijing), joining a market tour might allow you to experience much of the same magic, but with a native speaker on your side who can make sense of the orderly chaos. Taking cooking classes is relatively new to me. It started when I was in Beijing last March. 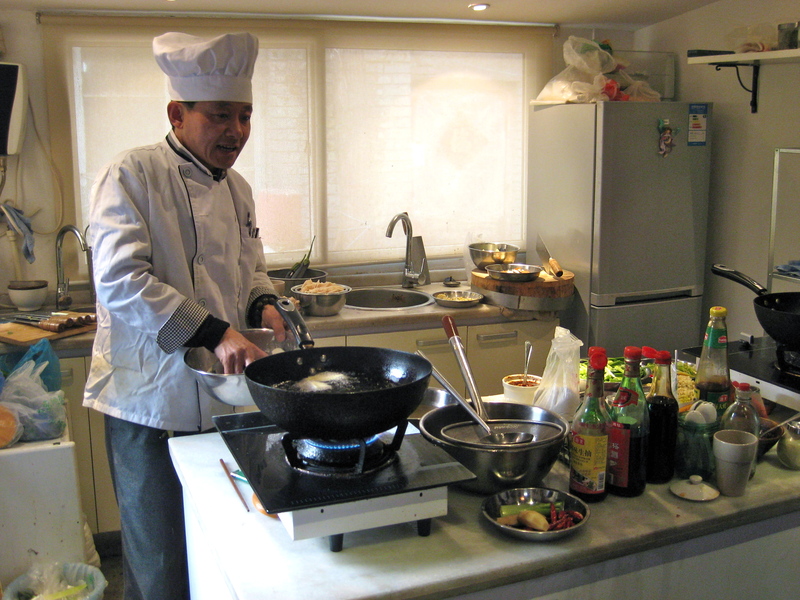 I took classes at two schools, Black Sesame Kitchen and The Hutong. 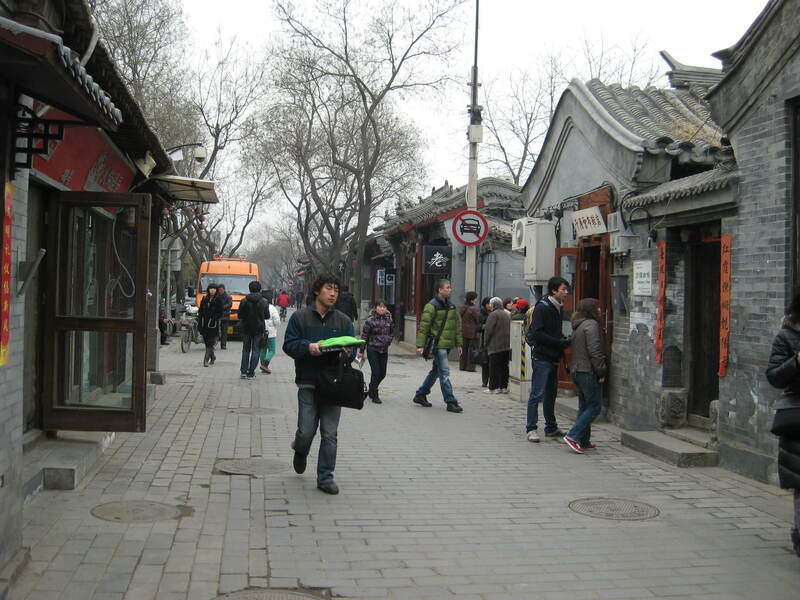 Both schools are in the old Hutong area of Beijing. If you’re traveling over there you have to visit, if not for the cooking schools then just to see what much of Beijing used to look like. Tiny houses and doorways open up to an elaborate labyrinth of interconnected courtyards. The streets are so small it’s a wonder cars are able to drive down them at all. On my visit, I found myself gawking at the maneuvering of two cars as they approached from opposite directions as if it were a circus act. Black Sesame Kitchen was the better of the two schools. A local chef does the cooking demonstrations, while Candice (an American-born Chinese woman) translates, teaches and coordinates the class making communication a non-issue. The class begins with an introduction to the Chinese pantry, tasting and smelling key ingredients. Many of you may think that Chinese ingredients are familiar to you. After all, you buy them in the ethnic food aisle at your local grocery store… Ummm nope. That’s not the same thing. Sesame oil that was pressed at the local morning wet market is COMPLETELY different in smell and taste than the stuff that came off the processing plant over a year ago. Freshly roasted and pressed the resulting oil is smokey, nutty and rich. The smell isn’t muddled by aging oil and additives. It’s pure, tasting and smelling like real sesame seeds rather some kind of complex chemical composition. Anyone who has ever tasted great olive oil or fresh made peanut butter knows the kind of difference I’m talking about. At Black Sesame Kitchen students receive a print out of the pantry basics both in English and Chinese with suggestions for the best brands of cooking wine, broad-bean paste and black vinegar (go out and buy Lao Chen cu from Shanxi province, it will change your life. Or at least your dumpling eating experiences). The kitchen and prep area are small but not uncomfortably so. The kitchen has two wok and burner sets. After learning the pantry basics students are given ingredients, wooden cutting boards and cleavers. Everyone gets to work prepping ingredients for the first dish. One of the best parts? Lining up whole garlic cloves and smacking them with the cleavers (makes getting the papery skins off easier) it’s sort of like playing wack-a-mole but in a kitchen… and with a very large knife. Fun but definitely not a skill appreciated in the fine-dining kitchen world I find myself in now. 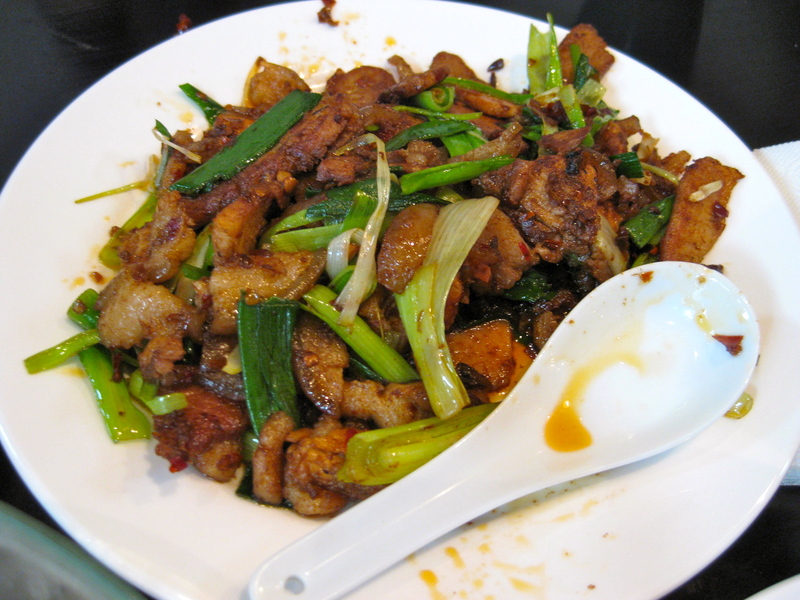 On the menu that day: Fish Fragrant Eggplant, Wok-Fried Bamboo Shoots, and Twice-Cooked Pork. All delicious, all relatively simple to make. Students prep and the chef tosses together examples of the dishes. Then the chef brings them to the communal tablewhere everyone samples the offerings. Next, each student picks a dish that they would like to learn hands-on. This is your chance to get behind the stove and put everything together. I chose to make Fish Fragrant Eggplant. It’s something I love to eat and unfortunately one that many American-Chinese restaurants love to screw up. After all the cooking is done, everyone sits around the cleaned prep table tasting the different dishes and chatting. Remember, cooking schools are a great place to get restaurant ideas–from other students but especially from the staff. Some of the best food we had in Thailand was at a restaurant suggested by someone at the cooking school in Koh Samui. And if you want to do the market thing on your own, just ask the instructor which one they would suggest you visit. So, those are my travel suggestions for the day. Next time you’re in an exotic location walk into a convenience store and take some time to look around. Buy the weirdest thing on the McDonald’s menu (or maybe just take a picture of it). Spend the morning at a local farmers’ market. And lastly, take a cooking class. There’s no better way to learn about the local food and take a little bit of that vacation magic home with you. Nice! Congrats on the bliggity! It reads delicious! Is it all going to be in the Chiners? I want more pics! I want to be able to scratch the screen and have it smell! Is there any video on the way? What are you cooking your lazy husband tonight? Are there going to be any dinner parties that you will document and then have the guests comment? Are you going to cook lots of food for your brother-in-law? Is it possible to make a dish more delish than miso-glazed cod?